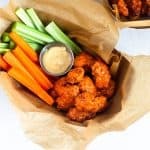 Healthy Air Fryer Boneless Buffalo Wings – a gluten free, easy, and absolutely delicious way to enjoy chicken strips at home without actually frying and all the fat. This recipe first appeared on Instagram in partnership with Philips Kitchen. 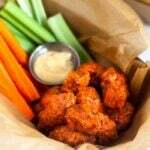 AIR FRYER BONELESS BUFFALO WINGS!!! Can you tell I’m excited!?!?! Seriously though, this may be one of my favorite recipes to date. If it’s not mine, I’m pretty sure it’s Michaels. He is obsessed. My love for buffalo anything runs deep – buffalo chicken tenders, buffalo Brussel sprouts, twice baked sweet potatoes, chicken salad – the list can go on. 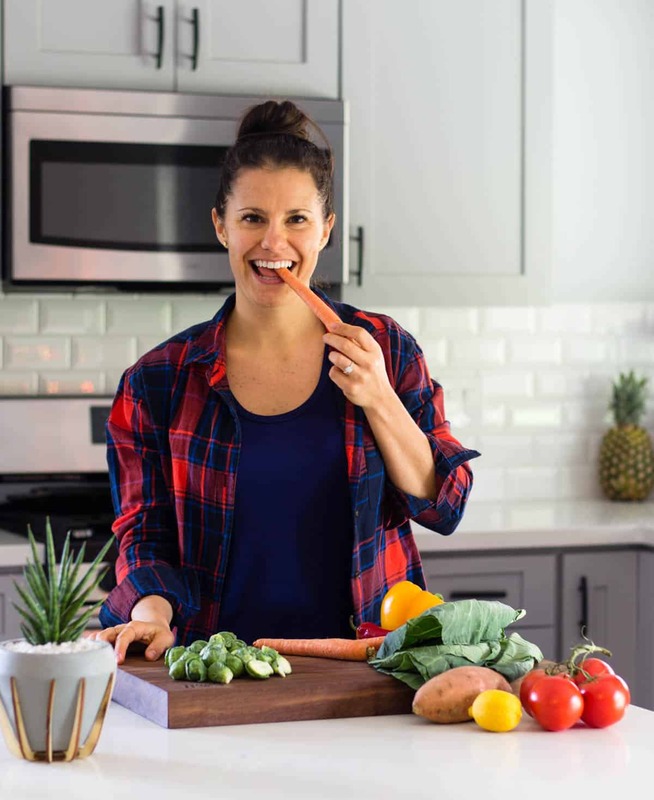 Chicken wings were one of my favorite things growing up and I’m so excited to share this easy and healthy way to make them at home with you guys! This is my second air fryer recipe this month. I talked about it before, but I am truly loving my air fryer. I mean if I can make boneless buffalo wings at home, how can you not love the thing. It makes “frying” foods so easy and you don’t have to use all the oil you normally would. It also gives you the perfect crispiness that sometimes you can’t achieve in the oven, and it’s a lot faster! 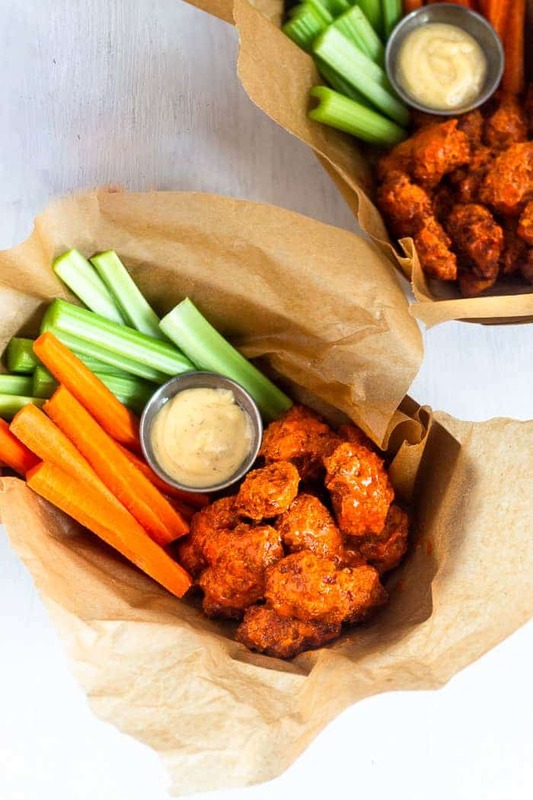 These air fryer boneless buffalo wings are lightly breaded in a homemade gluten free flour. Then baked in the air fryer for a crispy on the outside, juicy in the middle boneless buffalo wing. And finally tossed with an easy homemade buffalo sauce. The outcome is the best appetizer, party food, and snack. Perfect for the Super Bowl coming up next week if you ask me! The ingredients also make them naturally gluten free, dairy free, paleo, and Whole30 approved. Winning! You start out by making the flour mixture – mix together the almond flour, tapioca, chili powder, paprika, cayenne, and salt. Next you whisk the eggs in a shallow bowl. Then you start breading the chicken – take a piece and dip it in the egg wash, followed by the flour mixture, and then place it on a plate. Repeat with all the chicken. Place the chicken in a single layer in your air fryer, giving a little room between each one for even air flow. I sprayed them with a little avocado oil to get them crispy and brown on the outside, but you don’t need to. Set your air fryer on manual at 375 for 15 minutes. Pause around the midway point and carefully move the chicken around to make sure they are cooking evenly. You will probably have to cook your chicken in two batches depending on how big your air fryer is. While the chicken is in the air fryer, you make the buffalo sauce. 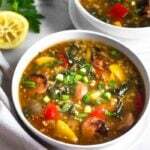 Combine all the ingredients in a small saucepan over low heat and cook until combined, about 2-3 minutes. Once the all chicken is done, all you need to do is toss it in the buffalo sauce. Make sure you are careful though and the breading doesn’t come off. That is it though! About 5 minutes of prep and 15-30 minutes of cook time (depending on how many batches), and most of that time is hands off. They are so easy to make! I haven’t tried another flour mixture, but I think substituting another nut flour (cashew would probably be best), would be the safest. I wouldn’t suggest coconut flour as the consistency is different and a lot dryer. If you have a store bought gluten free flour mix, I am pretty sure that work instead of the almond and tapioca, but I haven’t tried it so I’m not positive. Can I use store bought buffalo sauce? Absolutely! I honestly love this homemade version, but you could use a store bought variety if you don’t want to make your own. Some of my favorites at Tessemae’s or The New Primal. Can you can pan fry these? I haven’t tried, but I think you would be totally fine. You can follow the method for this popcorn chicken. Basically all you need to do is add about 3/4-1 cup of oil to a large skillet and let it get hot. Fry the chicken in batches, making sure not to over crowd them. Then just toss in the sauce and you are set! 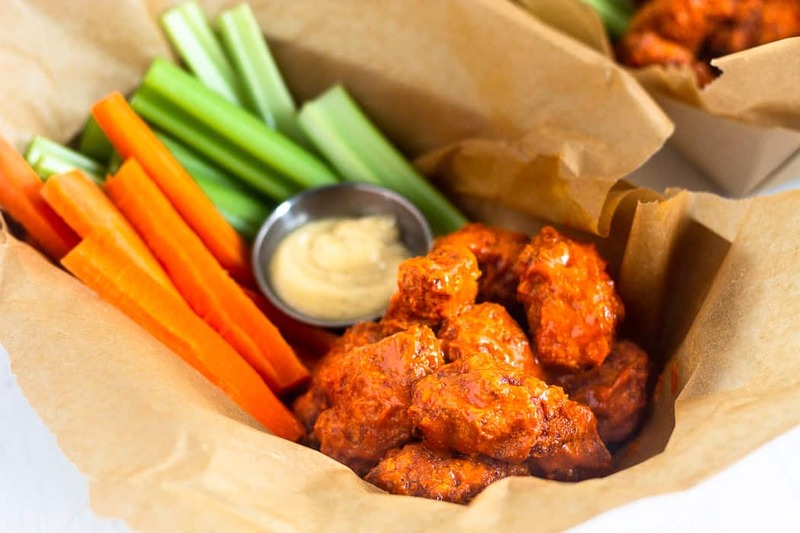 I hope you love these air fryer boneless buffalo wings as much as I do. I grew up eating buffalo chicken with my dad and friends and it holds a special place in my heart. It makes me so happy that I can now make it at home. Bonus points that I made a healthier, gluten free, and dairy free version of it! And if you read this dad, we are definitely making them when you guys come out in March!! Make sure to check out the video at the top of the page to see how easy it comes together! 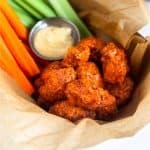 Healthy Air Fryer Boneless Buffalo Wings - a gluten free, easy, and absolutely delicious way to enjoy chicken strips at home without actually frying and all the fat. In a small bowl mix together the almond flour, tapioca flour, chili powder, paprika, cayenne, and salt and pepper. In another small bowl, add the whisked eggs. Set up an assembly line with cubed chicken, eggs, and flour mixture. Bread the chicken by dipping it in the egg mixture, making sure it is fully coated. Roll in the flour mixture, fully coating and shaking off any excess. Place on a plate and repeat with remaining chicken. 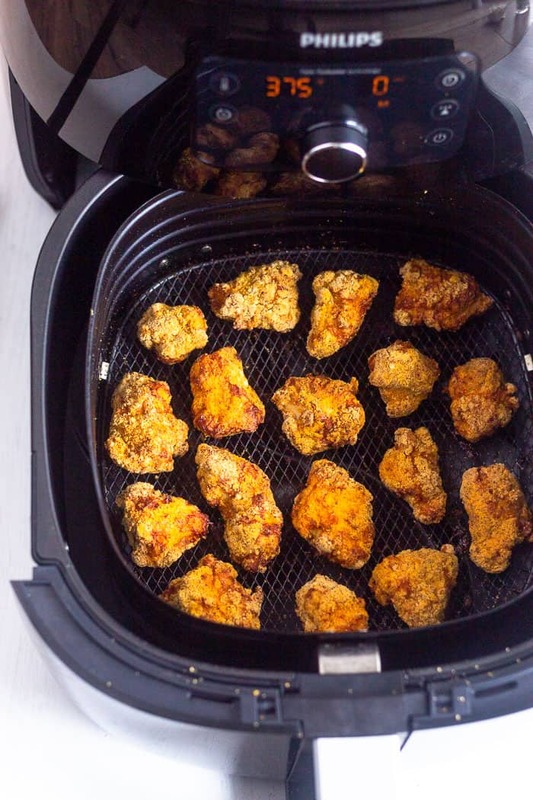 Place chicken in your air fryer basket, evenly spreading out and leaving room in between pieces so the air can easily flow through. If using, spray chicken with a light coating of avocado oil. Close drawer, set air fryer on manual at 375°F for 15 minutes, pausing halfway through to stir them up, making sure they are still evenly spread out after stirring. Depending on the size of your air fryer, you will probably have to cook the chicken in two batches to make sure they are not overcrowded. When the chicken is almost done, make the buffalo sauce. Add hot sauce, ghee, lemon juice, garlic powder, paprika, cayenne, and salt to a small saucepan over medium-low heat. Cook until warmed through and combined, about 3 minutes. Once chicken is done, add to a large bowl and pour buffalo sauce over chicken. Carefully mix to coat the chicken. Make sure to mix carefully as you don't want the breading to come off. Serve with ranch or blue cheese, carrots, celery, and more hot sauce! Love this recipe! I didn’t follow it exactly because I don’t have an air fryer (so I used avacado oil and a frying pan) and I used some different spices but WOW! I’ve been trying to make crispy chicken forever and it’s always just “okay” never AWESOME! The breading usually kind of falls apart and it’s never as crispy as I want but after seeing this recipe and adding the Tapioca Flour, FINALLY I have amazing crispy chicken! Thanks to this blog! Keep the recipes coming, girl! We love ‘em! Yay!!! So happy to hear that Amy! Thanks for trying it and glad you enjoyed! Thank you Mariah! Glad y’all liked it and thank you for trying it! I made these for dinner for the last night of my Whole30 and they were SO GOOD! 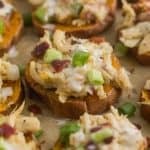 I love buffalo chicken and am always on the hunt for a healthier version. This recipe combined with the air fryer made perfect crispy nuggets. I will definitely be recommending this recipe! Yay!! So happy to hear that Jackie! They are our new favorite, thanks for trying them! Tried this recipe tonight on day 30 of my January Whole39 and it was AMAZING! We don’t have an air fryer so I baked them at 375 for 25 min, flipping halfway through, and broiled for 2 min/side at the end to crisp them up. Hubby and I both thought they were fantastic! My kids ate them without the sauce and they devoured them. This will definitely be a regular in our meal rotation from now on. Can’t wait to try more of your recipes! So glad they worked baking them! Glad y’all enjoyed them and thanks for trying them Stephanie! I made these buffalo tenders for dinner and OMG! It tastes just like take out but way healthier. My fiancé has not stopped talking about how delicious they were. Definitely making another batch for the Super Bowl! Yum! YAY!! Always love it when the guys approve! So glad you guys liked them and thanks for trying them Melissa! I just printed this recipe, and I will try it tomorrow for the “GAME” I don’t have an air fryer yet. Hi Terri!! Thank you! This is the air fryer I have and absolutely love it! I would definitely recommend. If you want to make them before you get one, you can try to pan fry them. A few others have tried it using this method and said it works – https://eatthegains.com/paleo-popcorn-chicken-whole30/ – also, if you scroll up on the comments, someone left a comment that they baked them in the oven (with directions) and it worked. Hope that helps!! Excited to try this recipe today! I dont have any Tapioca Flour. Do you think I can omit? Yay! I haven’t tried it without – I don’t think it is definitely required, but does help them get nice and crispy. Arrowroot would also work if you have that. Hope you enjoy! I didn’t have tapioca flour and just subbed it with almond flour… they were still delicious!! I ended up just using almond flour only. The taste on these were delicious and got lots of compliments, but I think I wish they were a little more crispy (my bad, I used the wrong temp setting plus after eliminating the tapioca flour that probably didn’t help either). Only comment from my DH was he wanted more sauce! I think mixing the ghee with the hot sauce and other spices is key! Thank you for the recipe! Glad you guys liked them! The tapioca definitely adds to help make them crispy, but good to know it works without. I always say more sauce, I can add that in the recipe notes! Thanks Amity! Super Bowl Sunday. A new air fryer. Coming off whole 30…. 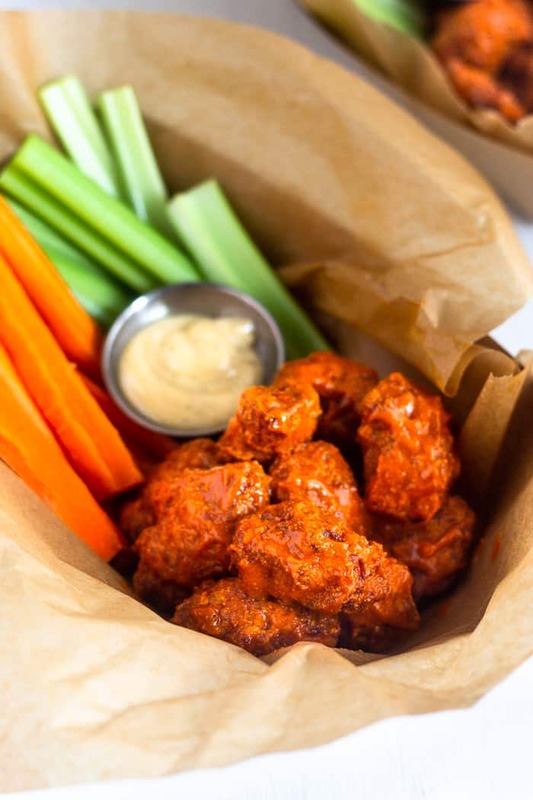 all perfect for making these Boneless Buffalo Wings! 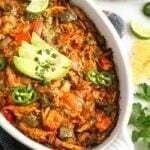 Kelly has the best recipes and this one is awesome! Air fryer gives it the crunch you need to feel “fried” and the buffalo sauce is the perfect addition! YUM! Yay for a new air fryer! Thank you so much for trying them Courtney and so glad you liked them!! I loved this recipe! It’s super easy to make and perfect while meal prepping – using the airfryer to free up the pan! Yay! So glad the whole family like them! Thanks for trying them Sigga! 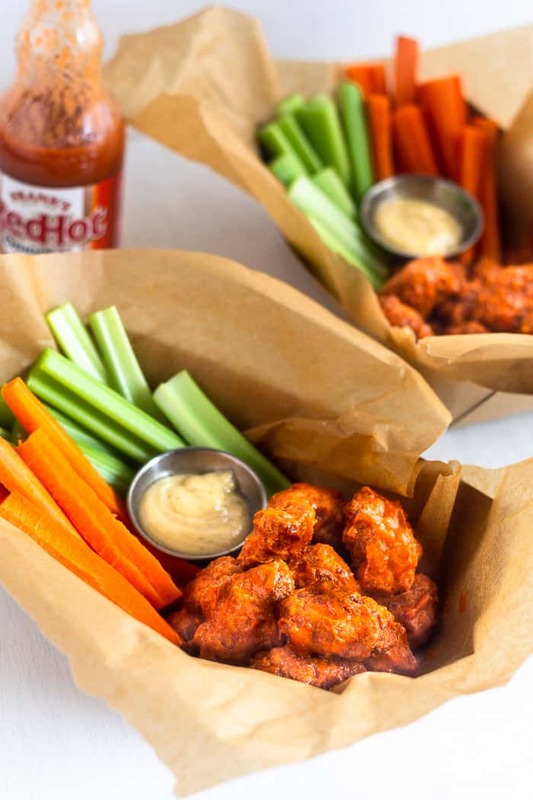 This recipe was perfect for the Super Bowl! I recently got an air fryer and this was the first recipe I tried – I didn’t even realize until reading through the comments that I left out the tapioca flour 🤦🏻‍♀️ But they were still DELICIOUS! I used The New Primal’s mustard BBQ instead of buffalo (since we had Buffalo chicken Dip on yesterday’s menu too) and they were so GOOD! Recipe couldn’t have been easier to follow (if you read the whole thing lol) and the leftovers are going to be perfect for salads this week! LOL! That happens to me a lot haha! I love that you used that BBQ sauce, it sounds amazing!! Thanks for trying them Shauna! Love that you made them in the oven! Thank you for trying them!! These were amazing! I pan fried them because I don’t have an air fryer, but they turned out awesome! My hubby was very impressed and it totally met our craving for boneless buffalo wings. Can’t wait to mags then again!! Woot woot! I love it when the guys approve too! Glad you liked them Catrina and thanks for trying them! Oh my goodness these were so yummy! I made these wings for my super bowl party and my crew loved the flavors! They were quite surprised that they were consuming something made from all whole ingredients. I did have a little bit of “stickage” of the breading but I did forget to flip them as I decided to double the recipe and cooked 3 separate batches, keeping my hands covered in raw chicken. Would definitely prep them all ahead of time but wouldn’t change a thing about the recipe! They even inspired me to “rebake” the dish and turn them into something else. Will definitely make again! So glad to hear that everyone loved them Kathryn!! They are definitely great to reuse in salads and what not too. Thank you for trying them! Can you have cashews? 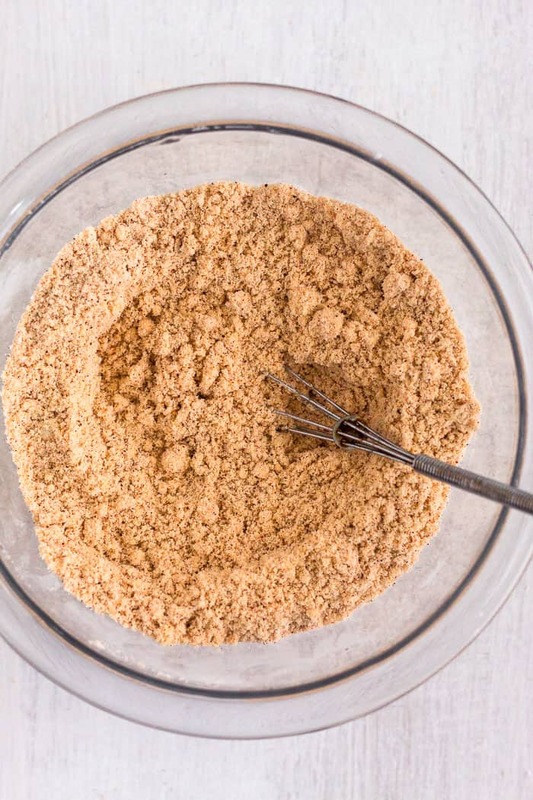 Cashew flour would be a great sub (you can just grind up cashews yourself to make flour too)! Let me know how they go! These were seriously so delicious and easy to make. I left some plain for my toddler and she loved them too. This recipe will be on regular rotation. So happy to hear that Dyanne! Thanks for giving them a try!